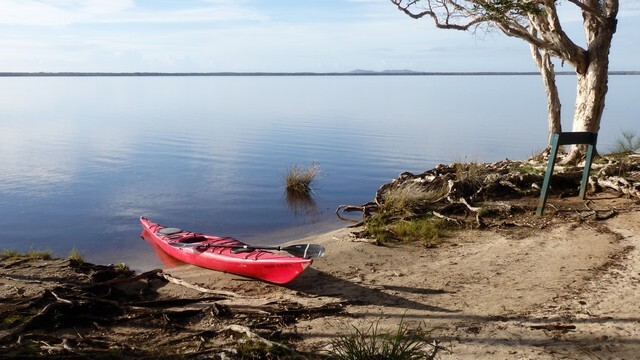 At 12 km x 6 km, Lake Cootharaba is the largest of the Noosa River lakes, yet has an average depth of only 1.5 metres. Aiming for the Kinaba Information Centre on the distant shore, I divert slightly to Mill Point and what remains of the small village and timber mill that existed here in the late 1800’s. 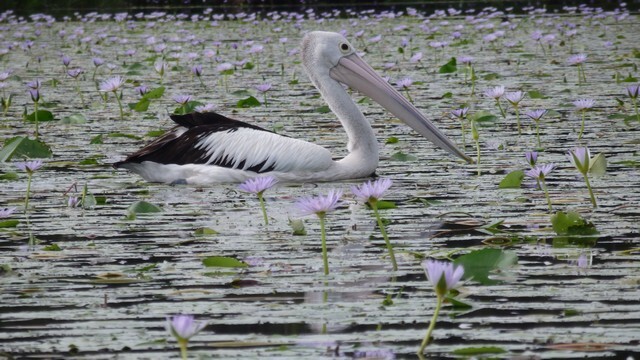 Soon after crossing Lake Cootharaba, I enter the ‘Everglades’ including the smaller Fig Tree Lake, which has a healthy population of ducks, cormorants and pelicans who float amongst the pink flowering lilly’s that blankets most of the lake. 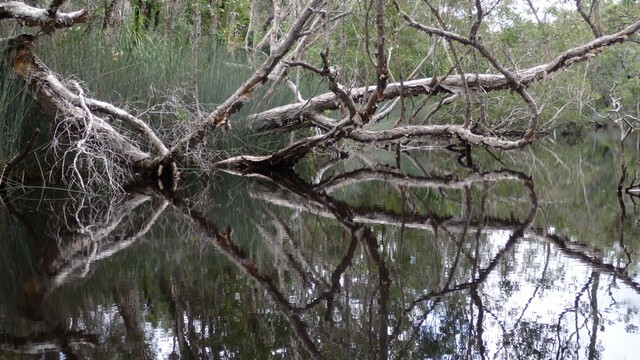 A little further on, the Upper Noosa River twists and turns through a section known as the ‘Narrows’, which is reknowned for it’s reflections! 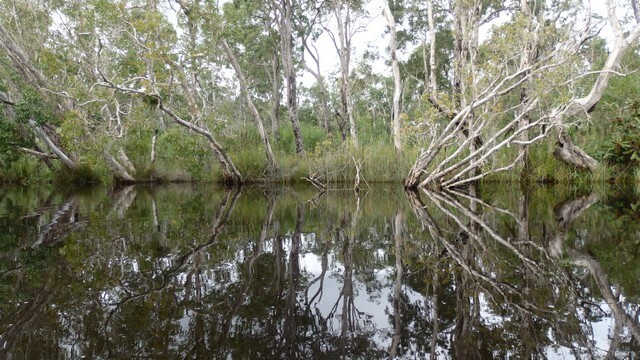 The mirror-like surface of the water forming almost perfect reflections of the adjacent vegetation and even cloud formations from above. 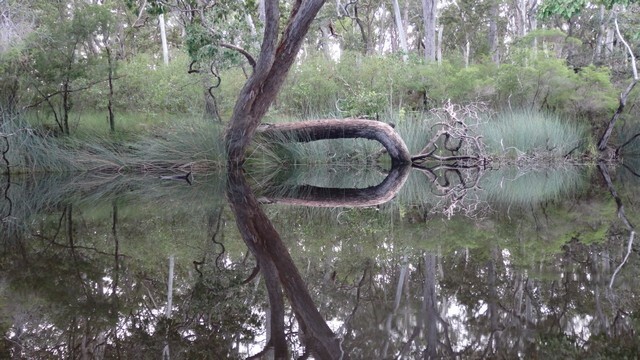 The reflecting phenomenon is largely due to the water being stained almost black from tannins washed from decaying teatree vegetation. 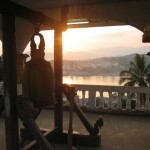 The tranquility and stillness of the water plays a cameo role. The reflections so vivid, it’s difficult to discern what’s real and what is ‘reflecting’. The river widens again just prior to reaching Harry’s Hut campground; once the site of a logging camp, it is now a camping and day-use area accessible by 4wd. After sharing lunch space with the Sunday crowds, I set off again destined for campsite 3. 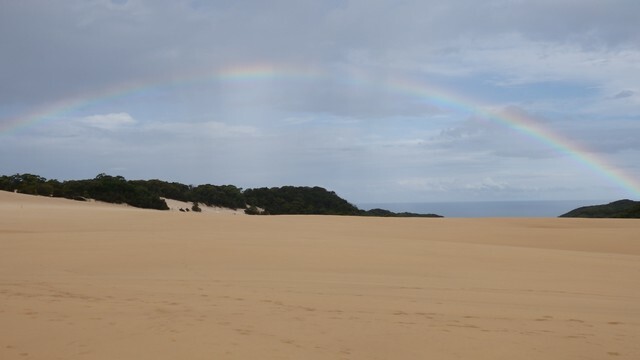 Campsite 3 is the starting point for the 12 km return walk to the Cooloola Sandpatch. 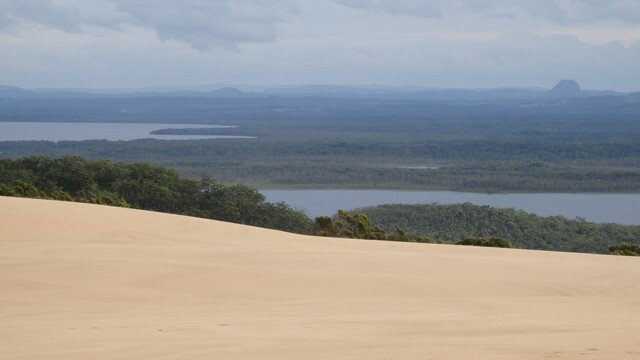 This large expanse of exposed sand dune is perched high on a ridge that separates the Upper Noosa River from the ocean. 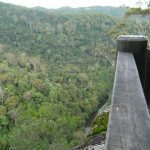 Offering spectacular views of the ocean, sweeping across to Lake Cootharaba and eventually west over the Cooloola section of the Great Sandy National Park. Arriving back at my riverside campsite in the fading light of dusk, I’m spellbound once again by the reflections of my surroundings in the water. Water so still, that a mosquito landing on the surface of the water before me, spreads ripples across the surface. The ‘images’ on the water so clear, that without needing to look up, I note approaching storm clouds from the west. The Upper Noosa River maintains it’s width right through to it’s origin where the Little Noosa River and Teewah Creek join at campsite 15. I explore briefly up both tributories before beginning the long paddle back to Harry’s Hut. 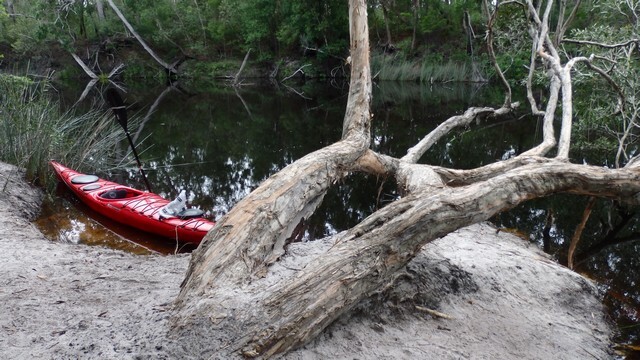 The slothful listless nature of the Upper Noosa River makes it virtually impossible to determine the direction of flow, making it ideal for novice paddlers. 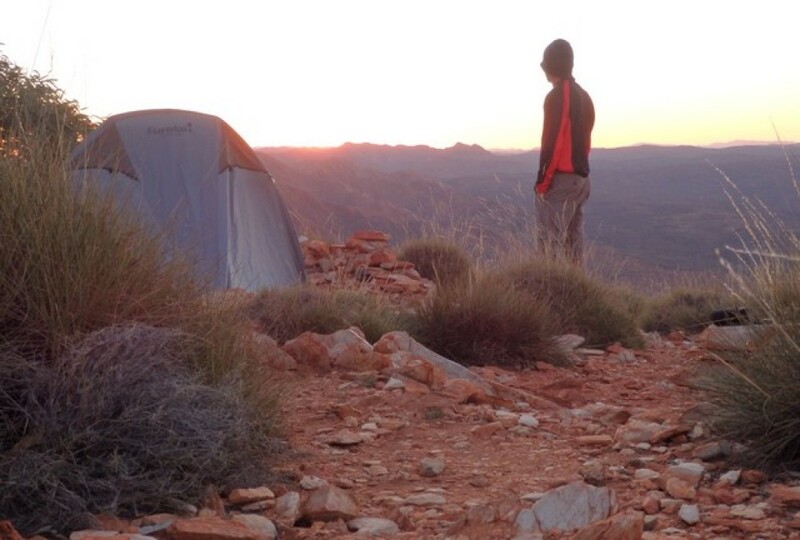 However the distances are not to be underestimated – Elanda Point to campsite 15 is over 30 km. Banksias and melaleuca line the river’s edge and unfortunately being Autumn, I can only try to imagine the kaleidoscope of colour of the Spring season flowering. Having negotiated the previous day and a half without a capsize, I pull into campsite 5 for a rest. Wearing a rainjacket to stay dry from the light intermittent rain of the previous hour or so proves to be a waste of time, as I unceremoniously flip the kayak and finish in the river! The final 30 minutes of paddling prior to reaching Harry’s Hut is in teeming rain. I reach the shore cold, wet and exhausted; and to be warmly greeted, not by the handful of 4wd campers who remain, but by hordes of mosquitoes desperately seeking a new host. 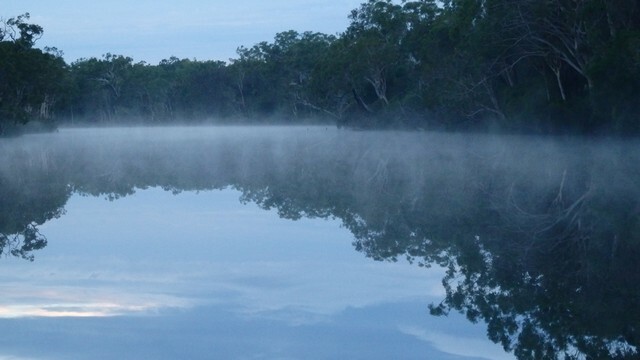 With an early 7.00 am start on the river, a mist hovers above the water providing a surreal experience as I re-enter the narrow section of the Upper Noosa River and once again feeling entranced with the surrounding reflections. I stop at Fig Tree Point, where the campground is currently under construction, with beautiful tables and bench seats rough cut from felled timber and even turfed campsites! Will be worthy of a visit upon completion! Emerging from behind Kinaba Island on the edge of Lake Cootharaba, I’m horrified to feel the full brunt of a stiff head wind. With the body beginning to feel the effects from two days kayaking and a 4 km paddle needed to get back across the lake; this was not the scripted finish to my little adventure. The peaceful glassed surface of the lake that I’d experienced two days prior, is now pumping small waves which are breaking over the kayak bow. Any attempt to stop and rest, results in a loss of momentum and going backwards! Exhausted I glide into the beach at Elanda Point. 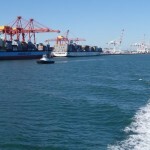 Co-incidently the wind also eases considerably…someone is having a laugh at my expense! 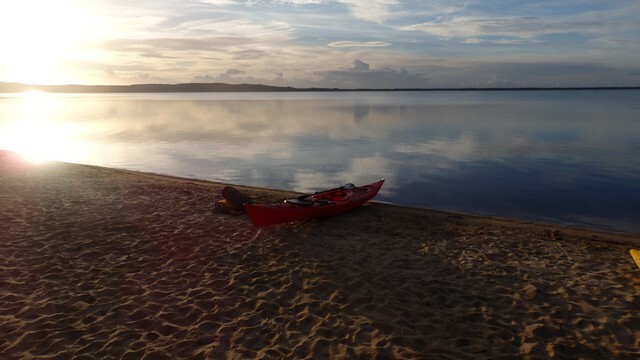 The Upper Noosa River is easily accessible and suitable for all levels of paddlers; the perfect place to dust off that old canoe/kayak sitting in the shed. 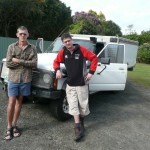 They can also be hired from Elanda Point or, as I did, from Roscoes Canoes in Brisbane. This entry was posted in Where to visit in Australia and tagged Cooloola Recreation Area, Cooloola Sandpatch, Elanda Point campground, Fig Tree Point, Great Sandy National Park, Harrys Hut, Lake Cootharaba, Noosa River Canoe Trail, Noosa River everglades, Noosa River kayak, Upper Noosa River, Upper Noosa River camping by danthewanderer. Bookmark the permalink. Great area, excellent photos and story. KEEP WALKING.